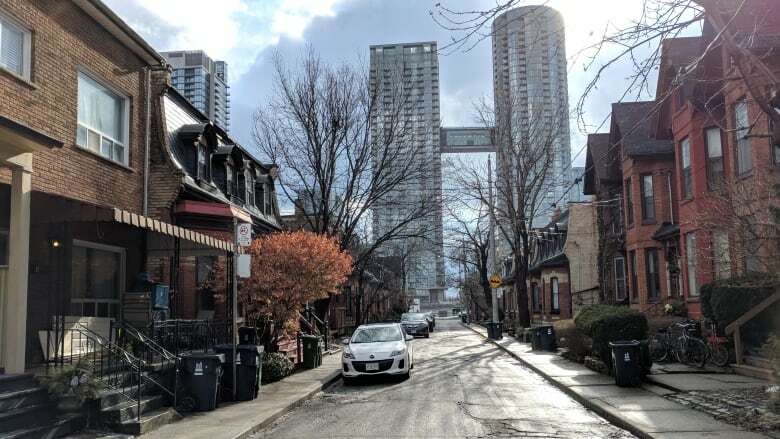 Average Toronto homeowners will spend around $100 more on their property tax this year, if city council backs the latest recommended budget. As usual in Toronto, property taxes have been front-and-centre in the debate over this year's city budget. On one side, Mayor John Tory and his allies back inflation-based increases — like the 2.55 per cent residential property tax hike recommended by city staff for 2019 that's tied to Tory's municipal election campaign promise. On the other side, critics say Toronto has plenty of room to raise property taxes to support city services — and should. During Thursday's budget debate, Tory's side easily won out, with council approving his plan 21-4 in favour. One recent Ryerson University report noted more than 20 municipalities across the Greater Toronto and Hamilton Area "recorded higher average property taxes than Toronto," and suggested the city could easily hike taxes by up to 20 per cent. "Property taxes raised on those of us that can afford it would go a really long way," noted Devika Shah, executive director of social justice non-profit Social Planning Toronto. "I think there are a lot of Torontonians in that category who would be willing to give up $10, $20 or $30 a year if it's going to be directed to critical issues like transit, housing, and child care." So what, exactly, do property tax hikes really add to your bill — and where does that cash go? Homeowners can now expect a 2.55 per cent increase in their property taxes this year. That means an increase of $74 for an average household with a home value assessed at $665,605 for 2019. Factored into the final total are a few other numbers, including Current Value Assessment increases which reflect property value assessments conducted on a four-year cycle. Then there's an added special tax levy approved by council in 2017, which contributes to a city fund for capital transit and housing projects. 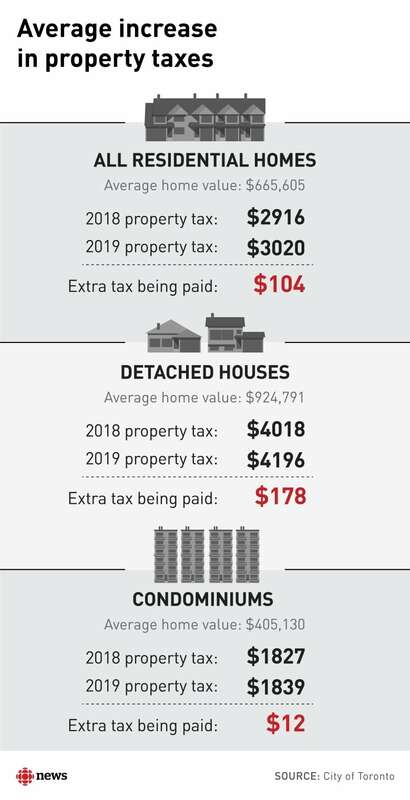 All that combined means a total property tax rate hike of 3.58 per cent, which would mean the average household would pay an extra $104 — bringing the grand total on an annual property tax bill to $3,020. Of course, that number can go up or down depending on your property value. Detached homeowners, for instance, would typically face a much larger increase, while many condo owners can expect just a double-digit rise. Renters, take note as well — if you live in a place without rent control, your landlord might want to pass along the extra expenses to you, too. Amid all the chatter about tax hikes, have you ever wondered where your cash is going? According to the city, on an average expected property tax bill of $3,020 this year, the largest chunk — roughly $700 — would be funnelled to the Toronto Police Service. 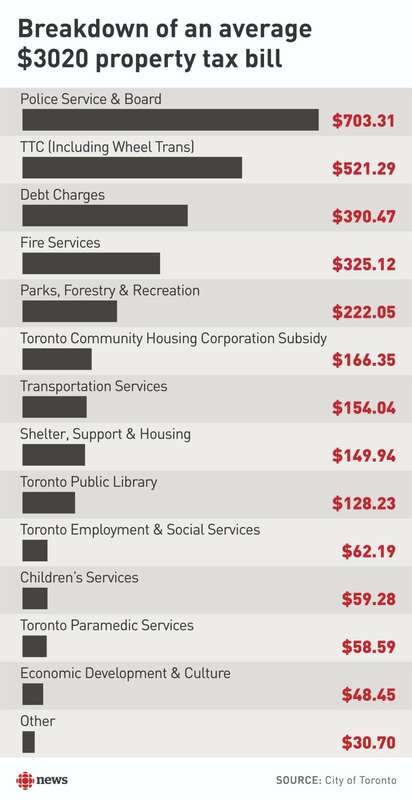 The next-biggest portion of around $520 would go to the TTC, followed by debt charges, Toronto Fire, and Parks, Forestry and Recreation. At the low end, nearly $50 of your payment would go to economic development and culture, just under $60 to Toronto Paramedic Services, and around the same for children's services and employment and social services. There's also around $30 slated for unspecified areas. In total, the TTC and emergency services for the city — including police, fire, and paramedics — account for more than half the average taxes paid by Toronto households. If you're a homeowner, be it a detached house or a bachelor condo, you'll notice a change this year. What's equally important to know is that many residents on a tight budget are often immune to these kinds of hikes. That's because of a property tax relief program offered by the city, which allows low-income seniors or low-income people living with a disability to apply for a cancellation of property tax increases. There's also an option to defer the payments — which means you'd only have to pay the city back if you no longer own your property.